Geek with an attitude: Freedom LOST at Software Freedom Day! Last Saturday, 16th of September, the Sri Lankan team geared up to celebrate the Software Freedom Day (SFD). As part of the day's events, it was decided to have them in popular hangout locations. After some debate, the locations were realized as be that of Majestic City, Crescat and Excel World. While we managed to secure the Crescat lobby by paying the reasonably quoted amount in advace, the quote from Excel World seemed too pricey, given the nature of the event. As Majestic City had already been secured (through Epsi computers), it was decided to drop Excel World as a location at the last minute, despite the pre-marketing brochures already mentioning otherwise. For the moment it seemed as if the management of Excel World, did not see any value in us having the event for the low price we asked. What follows is the story of how things took a completely different turn, at the last moment and how the three different managements of the three different locations affected us. Saturday morning, we turned up at Crescat with a bunch of computers, brochures and lots and lots of CDs. It was evident that the security personnel had already been informed of our arrival. They were very polite and helpful in getting Crecat opened. Further more the security guard was courteous enough to open the door for us when ever we wanted to move an item across as if we were customers walking in. It was about this time that the Fecom Technology's guy turned up with a couple of tables, a huge HP server and a couple of notebooks. The guys went about getting the Crescat lobby setup. Myself, the two guys from Matara and Ven. Mettavihari, on the otherhand departed towards the next location - Majestic City (MC). By the time we arrived at MC, the Epsi guys had already started getting the lobby setup. We offloaded some banners, CDs and handout and was pondering as to how we wanted to promote the SFD event, without hijacking the Epsi event. As this was the second day of Epsi's promotion, they already had their place including banners all setup. After a bit of inspection, we decided to hang three banners, one that was horizontal, just above the main stage like area and another two vertical banners just next to the horizontal one. Two way sticky tape seemed to do the trick, except that it took some time for the exercise. Half way through, tough, a security guard came up and asked if we were part of Epsi as if we were upto something illegal, to which we said "yes". He immediately just walked away with no hint at all as to what was to come! After finishing sticking up all three banners, and feeling somewhat proud as people looked up from below and down from above, we entered a bookshop to buy a white bristle board and a permanent marker. 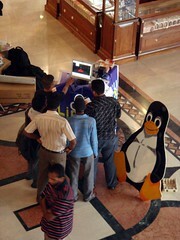 These were used to drew a sign with the message "Get your free (zero cost) GNU/Linux CD!". We placed a few handouts and CDs on top of the piano at MC, and had just finished sticking up the "free CD" sign on the granite beam right next to the piano, when the same security guard came walking (fast) back telling us to take it down! My initial reaction was, "Sorry, we'll take the sign down", as we had a doubt whether it was proper to stick a sign up on the beam. But then, he insisted that we should also take down the banners! The banners we spent a good 20 minutes sticking up and getting it just right. Just then my phone rang! It was a guy from Epsi on the other line apologizing and explaining that we have to bring down the banners and that he had just got blasted from the MC management. I asked him if there was anything that could be done but he seemed sure there wasn't. "These guys are very touch", he told me. We decided, that we should try to talk to the management and explain that we were part of the Epsi promotion. The previous year, we had already had a similar promotion with the Notebook shop which was very successful. We asked the security guard if we can talk to the management. He said that we should talk to the head of security and vaguely pointed his finger to a man. It wasn't clear who he was pointing to. We asked again. Again he pointed to a person in a crowd. It was evident he did not want to be the one to introduce us to his superior. I mean the security guard that was literally telling us to bring down the banners and posters seemed scared. So we followed the man we thought was the head of security. He quicky went into Cargills, so we too went into Cargills. He seemed like a nice person, who was walking slowly, looking around, not much keen on buying anything. Sort of like an undercover agent, masquerading as a customer. My self and Hamudurowo approached him together and asked, "We were told that you are the head of security". The man calm and smiled and said no. Soon we saw his family walk over to him. We knew we had the wrong guy so said sorry and went back to catch the guard. Now he was pointing to another person who was speaking loud with one of the Epsi guys. We walked over to him and said are you the head of security. He barked at us saying, "This does not concern you!". Hamuduro and I tried to explain that today was a special event to which he said, you have no permission. We explained that we were part of the Epsi promotion but he said that Epsi had no permission to hang banners in the middle or to get any other party involved. We asked if there was anyway to which he kept nodding and moving his face away as to walk off. We finally said, that we'll pay to which gave a steep gaze and said, this place costs 15,000/- but since Epsi has a shop its free for them. We asked if we can pay that but he said, "Send a proposal and we will have to put it to the board". Then if we want we will allow. We tried to ask the procedure of how to get the location in detail to which he snapped and repeated, send a proposal and we will decide. We said that we had this event last year, to which he replied, "I didn't know about this last year". We explained that we had publicized and was bringing in people to the location to which he gave a blind look. By this time he was very angry and popping like a can of pop corn. He told that we couldn't not have the promotion and that we should immediately "Get out!". All our attempts to talk sense with the guy had failed, miserably. He didn't have any decency to even ask what we were trying to do there. We decided to can the location since we didn't want Epsi's promotion to be in jeopardy. The Epsi guys were quite upset as well. They didn't expect this but knew that MC was very tough and a bully. They had the shop at MC for the last 14 years but still was treated like dirt. We decided to focus primarily at Crescat and so went back. But since the brochure's had mentioned Excel world, and since we were down to just one location out of 3, we decided to send a small team to just sit at Excel World with some brochures and CDs while having some food. No banners, no computers, just some handouts so as to not cause much of a problem. A senior person from the management had seen us and the team had also identified him as management and had approached him for permission. He had given the permission and had wanted to offer a better rate and so had asked for my phone number. I got a call from that person saying that he was very busy and that he would like to work with the community and offer a better rate. Though it wasn't as low as Crescat, the rate seemed fair enough and so I gave the goahead. He offered us the necessary arrangements to bring computers and setup. Later that evening after the Crescat event was no longer happening, we moved all the computers to Excel world and continued celebrating well into the night. 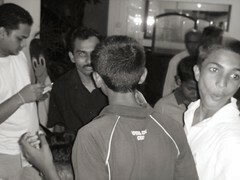 Since it was Karoke night, there the place was packed and out of which some people visited out table. So except for MC, who got overally hot tempered and as a result, totally lost it in front of customers, the other two locations was very much supportative. The management at MC has somehow built up a massive ego and a bureaucracy that they ended up ruining their image with us. They have violated our freedom to celebrate an important day in a peaceful manner which could have added a lot of value to them. As a result, I don't see myself ever wanting to have a promotion at MC but am looking forward to having more of such events at the other two locations. Any way happy to hear that other locations were quite successful,. It's nice & descriptive. There's almost everything we faced on that special day.Now all we got to do is make the next one better. Hi Thusahara, actually if at all we should have done this on Friday when Epsi started their exhibition. Apprently even for that they would have to mention where the banners were supposed to go up on the proposal and there was no room for change with these bureaucrat s.
If we knew how this was going to turn out in the begining we could have taken measures or even avoided the place alltogether... but everything just started unfolding all of a sudden. Anyway the other locations went pretty well.